You’re looking into a mortgage so that you can buy a home. Congratulations! 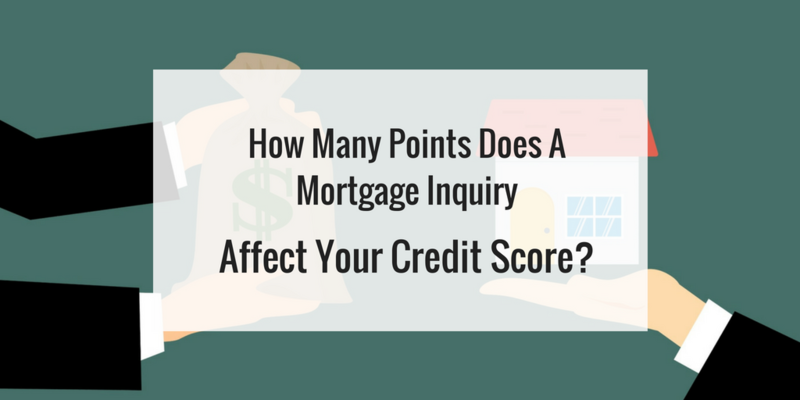 You’ve worked up until this point making sure that your credit is what it needs to be to get a loan, but now you’re worried that shopping around may decrease your score and you’re wondering how many points a mortgage inquiry will affect your score. It is true that hard inquiries will decrease your score, but you can rest easy knowing the impact will largely be marginal. In today’s post, you’ll learn everything you need to know about mortgage inquiries. Spoiler alert: There’s not much to worry about. Contrary to popular belief, the credit system is not trying to work against you. They understand that shopping around for the best rate is in your best interest, and they aren’t looking to punish you for that. For that reason, inquiries into loans like mortgages and automobiles made within a certain time frame (anywhere from 2 to 6 weeks) will actually count as one inquiry. So, applying for many loan quotes will not hurt your credit as long as you do it fast. And that will save you time and money in the long run! Chances are, if you’re actually putting in hard inquiries, you are ready to buy soon. There is a 30-day delay between when the mortgage loan is quoted and when it actually hits your credit report. So, those home loans you are applying for aren’t even visible to lenders. This means that they aren’t seeing the multiple applications you sent in. No reason to worry about lenders subjectively declining you either. They won’t even be able to see it until 30 days after it’s all said and done. 3. How Much Does An Inquiry Affect a Score Anyway? As with most things credit, it depends. There are many factors and the more storied your credit history, the less any single change will affect it at all. Generally though, even with newer or more sparse histories, a single inquiry wouldn’t be much at all, maybe five to ten points. Since credit card inquiries do not get lumped together into one, applying for multiple credit cards in any time period would continue to affect your score and the amount of damage it does would compound with each new inquiry. But with mortgage inquiries, you won’t have this problem. And you should see very minimal damage to your perfectly polished credit score. You’ve worked hard to get yourself into the position you’re in. Buying a house is an exciting step and you don’t need that feeling to be weighed down by additional worry about every factor of applying for your loan or a few credit points. Shop around if you’d like and find that loan that works best for your individual needs. In fact, this is likely to increase your score in the long run, because you won’t find yourself in a loan that you cannot repay because you took the first one offered to you. 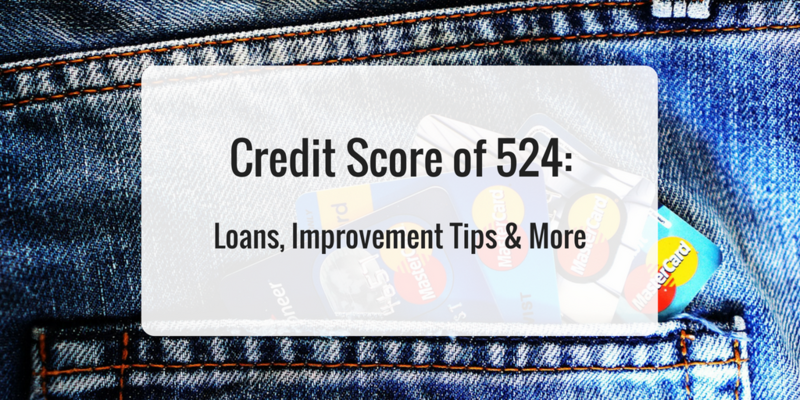 Having a credit score of 524 means that you have some work to do. Ranked squarely in the lowest tier of scores, you are facing elevated interest rates on any loans and credit you are able to obtain—or rejection from them all together. There is confusion on how credit scores actually affect car and home loans and credit cards. Will the interest rates be too high for me? Will I just be rejected? Luckily, it’s all answered below. For a first time home buyer with a credit score of 524, you will most definitely be fighting an uphill battle. The majority of loans will reject you outright as your score is lower than their usual threshold of 620 by almost 100 points. If you do find a loan that is willing to take you, the lower your score, the more that your interest rate skyrockets. With a score that low, the amount of interest you pay on the house could be upwards of half the principal loan, a lofty price to pay for poor credit. Increasing your score is going to be your best bet to getting a decent home loan. It may take a couple years to fix and it will be frustrating, but even 100 more points on your credit score can improve your chances drastically and knock an interest percentage upwards of 2%! Car loans are similar in terms of interest rates and possible rejection through conventional means, but a car loan will be at least easier to find. The rates may once again be too high for you to consider this a viable choice, though. Using the average $27,000 dollars for a car loan and a 60-month loan, a score of 524 could land you an average APR of upwards of nearly 16% and an interest over the life of loan of nearly $12,000 extra dollars! Once again, it is in your best interest to improve your score or you may fall victim to predatory lending. Credit cards are not going to be easy to come by, either. This is the unfortunate fact of having a low score. Honestly, obtaining an unsecured credit card will probably be impossible. However, unsecured credit cards, or ones where you must make a deposit to obtain, will be beneficial to improving your score. Your score may even jump by opening the card. And if you pay off your debt on time every month, the number will continue to climb. You will need to improve your score to be put into a more comfortable position. You may be able to get loans, but the interest rates will be high and could nearly double your loan… Start with a secured credit card and work your way up and pay on time every month. You’ll be glad you did. So your credit score is 578 – is that good or bad? 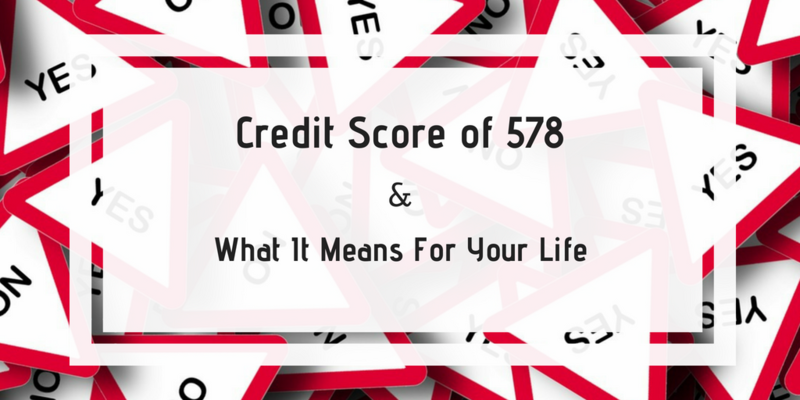 What does a credit score of 578 say about you? Your credit score reflects your ability to fulfill fiscal responsibility. The lower your credit score is, the larger your risk of having to make a big deposit before making home and auto purchases. A credit score of 578 falls under the “Poor” FICO category. Scores below 619 often receive the most severe interest rates and terms on credit and loans. The effects can damage a person’s pursuit of happiness. You want to improve your credit score so that you are paying less for borrowing money. What does having a credit score of 578 mean for home loans, car loans, and credit cards? How do you improve a 578 credit score? PROBABLY NOT — For most mortgages, you need to be above a 620 credit score. Generally speaking, with a score under 578, you may not qualify for mortgages with many lenders. If you do, you should anticipate interest rates ranging from 5-6%. There are a few loans out there, such as those administered by the Federal Housing Administration (“FHA loans”). However, it can still be tough. The frustration gets real when it comes to housing loans. YES — buying a car with a credit score of 578 is still possible, but the interest rate can be pretty high. People with bad credit are always offered higher interest rates than someone with a score only 70 points higher. The average amount borrowed by auto buyers in 2018 has risen to a record high of $31,099. Here are the cost differences for 3 common types of auto loans accessible in myFICO’s loan savings calculator — 36-month, 48-month, and 60-month new auto loans — between someone with a credit score of 578 and someone with a score of 648. Can you believe that a 70-point difference in credit scores results in a difference of $5,266 in auto payment? Don’t let your wallet bleed. If your score changed to a 648 — just a 70-point improvement — you would save thousands of dollars. What’s the best credit card for a score of 578? OPTIONS ARE OUT THERE — If your credit score is a 578, you are only a little short of an average score. It is possible to qualify for an unsecured or secured credit card. There are many reasons to get started, and there are simple ways to go about it. Be smart when shopping for a loan. Applying for several loans or credit cards in a row can drastically hurt your score. If you pace out your loan shopping in a three-week period, for example, there’s a good chance it won’t count against you. Pay back your credit on time. Your credit score reflects how well you handle your money and how likely you are to repay a creditor, on time and within terms. Let your credit score communicate your reliability.